Kathranne Knight began the Correspondence Project in 2014. In late 2015, Lori Shine joined as co-publisher of the venture. They used this email interview, conducted in December 2015 and January 2016, as a way to bring Lori up to speed on the history of the project, and to discuss the methods and processes behind it. Lori Shine: Can you tell me a little about the genesis of the Correspondence Project? What experiences or questions did it begin to arise from? Kathranne Knight: The Correspondence Project came out of a few intersecting impulses, a collision of sorts, that happened while writing a grant proposal. Ironically, the grant did not require a project (a rare thing), but I was relatively new to town, missing my connections in Massachusetts and New York, and wanted to include those people I had left behind in some way through this grant. At the same time, I was aware of a printmaker in Ames (Asa Wentzel Fisher) who had trained at the Tamarind Institute in New Mexico and I desperately (selfishly!) wanted him to succeed in his fledgling business so I could take advantage of his skills. One of the most meaningful ways to maintain my connection to artists back East was through writing letters to one particular artist, Katia Santibanez. This exchange and reporting, of our thoughts around making art and also of the mundane day-to-day stuff, had a strong effect on me. In part this came from the activity of writing my thoughts on paper, but also from receiving her handwritten missives in the mail. The tangible part of this exchange was clearly important. I was meeting new artists and keeping up with old connections, sending and receiving mail, and I wanted to expand these little events in some way; tighten and codify them, I suppose. 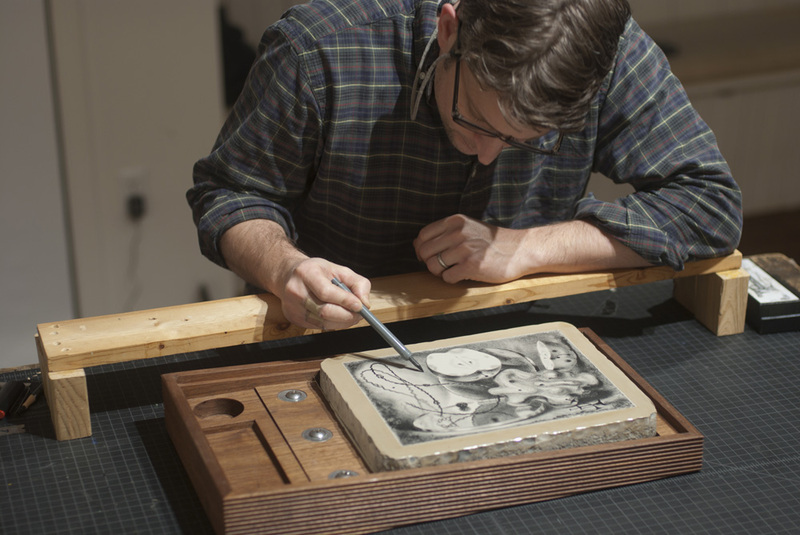 In a conversation with Asa about all of this, he spoke of his desire to reach more artists too, and it came out that we might be able to send a lithography stone through the mail. I fell for this idea in a big way and used nearly all my grant money to pay for the design and production of two traveling boxes. The idea to rope poets into the process has its beginnings in you, Lori, as you were instrumental in introducing me to the world of readings and contemporary poetry. I started going to readings with you in Massachusetts and we talked a lot about the structure of poems, how content is brought forth and the striking parallels in poetry and visual culture. Visual language (line, tone, space, form, and color) and the way poets use words to bring out meaning through line, space, form, and music share some pretty interesting and mutually exciting things. So, I started with the very talented people around me, a genuine desire to stay in dialogue with them, and an idea to expand this group exponentially by inviting them to introduce me to more poets and more artists. LS: It’s interesting to me that you started with the relationships and then, when you thought about a project, you looked to the skills and talents of the people you were corresponding with. I love that idea of the widening circle of conversation, and of continuing the conversation through a project. It’s striking that the physicality of receiving something in the mail is really important to the relationship and to the project. Something so heavy and hand-worked and beautiful commands the attention of the person it’s sent to. I’m struck by the physicality of the boxes, the heaviness of the stone, the choice of the old technology of hand-printed lithography. I want to know a little more about why the choices of methods and materials here matter to you. KK: Yes! The materials have a compelling presence and are highly suggestive. Material choice has been an elevated part of my art making for some time in that I consider it like I would subject or content; it has an equal voice. Because Asa is a lithographer, I started thinking about stones, earth, and weight. Because my friend Nate is a poet, I thought of language, paper, and material lightness. The lithograph stone would need to travel and Asa had some walnut boards, cut from trees on his father’s farm, which we could use to make a box. Wood, stone, paper, waxy pencils, words, and ink became our materials and to my mind are immediately evocative (hard, rough, transparent, liquid, thin, delicate, heavy, solid, ancient, fluid, and opaque). There were also the actions to consider; that we were going to communicate, cross borders, reproduce, draw, write, send, and receive (to name a few). The cabinet-maker who made the boxes, Brian Cullen, took these underlying material qualities and embedded them in his design, riffing on things like shifting tectonic plates and sheaves of paper. He imagined the boxes as emissaries and created exquisite, tough, and sensual containers. They set the tone for the artist and poet in a pretty dramatic way. On top of this, he made these huge, rough crates with metal handles and enormous screws to house the beautiful boxes on their travels, so there is effort and tension in receiving them, and a pretty heavy dose of absurdity. So, every part matters to me, from conception to materials, the how of it; it is all important. LS: Do the poets and visual artists have a relationship before you pair them? Do the artists see the poem before they work on the stone? Or vice versa? KK: So far, the poets and visual artists have not known one another before they are paired, though once they are, I send them links to each other’s work and they are free to explore in this way. It was important it not be a direct collaboration, translation or ekphrastic relationship between the poem and the visual work. I’ve seen a lot of that and it can be quite good and interesting, but I wanted to value the stream of thought, idea and work already in progress in each participant’s studio, and let those systems of meaning already percolating come in contact with the other as a whole body. When artists collaborate it can be like they’re sharing a secret; they’re talking to each other, responding, and then the viewer comes in after the action has occurred. But in this project, the artist and poet work separately, and then the two systems of meaning are put next to each other and the viewer gets to share in the recognition of how each work corresponds to the other. During the proofing process these corollary sparks, rubbing, and volleying of meaning are recognized and either brought forward or mitigated, depending on the artist’s desires, through small movements like positioning, spacing and color. So, it is very interesting to me how the viewer completes the circle and is made aware of these correspondences in a subtle, but active way. The viewer becomes the third collaborator. They’re on the same footing as the artist and poet. LS: Reading the image through the poem, and reading the poem through the image. And that spark is happening for the poet and the artist when they see the print for the first time, too. I remember you saying that reading the word “landslide” in Michael O’Brien’s poem seemed to emphasize the slippage in the piece of yours it is paired with, and that when you get to the word “pond” in his poem, the spiral shape of the visual art starts to read as a series of ripples. The mind makes those connections. I love the discovery inherent in this process, and that everybody gets to make discoveries: the poet, the artist, the viewer. Can you talk a little bit about how the project is evolving and changing based on the discoveries you’ve made so far—both aesthetically and procedurally? KK: There have been significant discoveries for me in the first two editions. I am new to lithography, new to publishing, and have dived into both of these with a kind of naivete mixed with bravado that has yielded beautiful prints, but also challenges. For me, the deepest technical discovery was in watching Asa make the proofs and realizing the stone is a living, reacting, fickle thing. Though it is in part a mechanical process, and one of reproduction, every time the stone makes a pass over paper it changes, and Asa has to shepherd the stone and paper to where you want it. It is a much more mercurial process than I knew. The next edition with Joshua Marsh and Kate Greenstreet will have them in Iowa for a big chunk of the proofing process in order to eliminate the Fedex back and forth for that part of the project. Proofing through the mail can make for a jerky momentum and we’re trying to remedy that by having the artist and poet present with Asa as much as possible. LS: So, the poets write their poems first on the sheets of mylar in the wooden box, correct? But early in the process, the feeling arose that the poems should be typeset. Can you talk a little bit about why? KK: Though I set the initial parameters and concept of the project, it is ultimately driven by the artists and poets, the work they make, and what that work needs. Some poets and artists will choose type, rather than handwriting, as the preferred form for a poem. I think handwriting, as a form, contains unique qualities, and has the ability, or danger, to put biography or a layer of intimacy and time into the reading of the poem. But, if it doesn’t service the work, then it shouldn’t be used. The decision is totally up to the poet and artist. LS: When you went to put the poem and art together on one sheet, what sorts of visual notions were you running into? How did you decide about the placement? KK: This is the most exciting and revelatory moment for me, because the poem and image are two autonomous things, yet as they approach one another on the page there is an electric response between them. It is seemingly so simple, but it couldn’t be more complex and fascinating in how white space becomes activated and descriptive; how notions of power or hierarchy are brought up depending on the weight of each contribution and where it is placed on the page. The eye and mind travel from image to word and you can play with the rhythm of this movement in how you arrange the works. For instance, in the print with Michael O’Brien, there was a configuration we tried where the image was placed to the right of the poem and placed in such a way that it looked cochlear; as if it were listening to the poem. The end of some lines in the poem were placed to kind of drop into the spaces in the spiral and this conflated the poem and image. Because the correspondences are already very strong between the imagery of the poem and the image done by me, we opted for a less forceful association, one that would allow the viewer more room to investigate and where the associations between the two works would have a chance to coalesce and come apart again. LS: I know that this project comes to us in a way as a corollary of our own friendship, and so yes, we know that you and I have lots to say to each other as a poet and a visual artist! We’ve been talking for years! So I love that this project extends the benefits of that cross-disciplinary conversation and looks for affinities in the different artistic processes people have. Learning some of the concerns and language of visual artists, and how they approach their work, has been revelatory for my own work. But I think it can have repercussions that spill out beyond the personal correspondences and into the larger discourse. Do you have a vision for where these kinds of cross-disciplinary conversations might lead? KK: I want it to lead to more; more knowledge for me, more questions and trials, experimentation and discovery. More exhibitions, catalogs, readings, and guest curators. There is no “vision” per se of what the project can or should do; it operates as a tool for wondering and questioning. It is fertile ground that, for this project, has only just been turned, so it’s difficult to say exactly what will come from it, but there is value in the questioning, pushing, and pursuit of the unknown. That being said, I would like to see this endeavor extend far into the future; pulling artists and poets from different generations, practices and geographies. I would like Correspondence to enter into dialogue with the pioneers of these experiments such as Grenfell Press and ULAE. Ultimately, it is stimulating to read a poem, to have language falling in your brain; then shift to an image and experience another kind of falling and pulling together. It’s not that poetry and visual art work in the same way, it’s that going deep into each can reveal or begin to unfold the weird way in which each form works on you. One opens you up to the other.